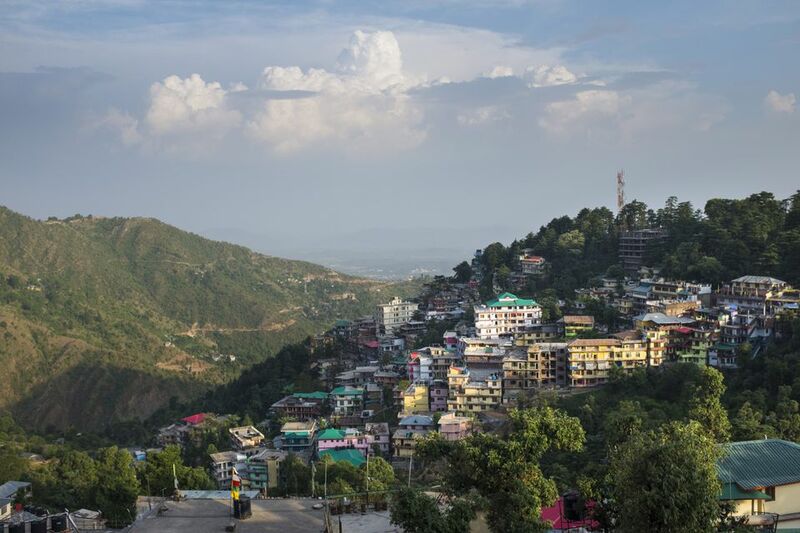 Located in the Himachal Pradesh region of India, McLeod Ganj is home to the Dalai Lama, the Tibetan government in exile, and thousands of Tibetan refugees. When most travelers say "Dharamsala" or "Daramshala," they are probably referring to the touristy suburb of Upper Dharamsala, better known as McLeod Ganj. Few actually go down the valley to the city of Dharamsala itself. "Little Lhasa," as McLeod Ganj is sometimes called, attracts a torrent of travelers who come to learn about Tibetan culture and attend spiritual retreats near the Himalayas. Set into the hillsides of the green Kangra Valley, Mcleod Ganj is one of the most popular destinations in Himachal Pradesh and certainly has a different vibe than the rest of India. Both for budget reasons and convenience, most travelers arrive in McLeod Ganj by bus. Numerous tourist buses run travelers between McLeod Ganj, Delhi, and other popular stops in North India such as Manali. The nearest airport is in Gaggal (airport code: DHM), around 45 minutes by taxi from McLeod Ganj. The bus journey to McLeod Ganj isn't especially comfortable. The elevation and winding, mountainous roads require some patience. Plan on at least 10 hours from New Delhi; at least 13 hours if traveling by night bus. Most tourist buses arrive just below the main square in the northern part of McLeod Ganj. You'll need to walk 200 meters up a hill to the main part of town. Two roads, Jogiwara (also spelled Jogibara) Road and Temple Road, lead south from the small main square and form a ring. At the end of Temple Road is the Tsuglagkhang Complex — home of the 14th Dalai Lama and the most popular attraction in town. Bhagsu Road leads east out of the main square and is lined with numerous mid-range guesthouses and cafes catering to travelers. A small path branches off of Jogiwara Road to the east; the steep set of stairs by Yongling School leads to a lower section of McLeod Ganj where you will find additional budget guesthouses. All of McLeod Ganj can be covered on foot, although there are plenty of taxis and rickshaws in the main square when you're ready to visit neighboring villages or attractions. McLeod Ganj itself is compact; it can be walked from end to end in around only 15 minutes. As home to the 14th Dalai Lama and home-in-exile to a large Tibetan community, you'll see plenty of Tibetan refugees and maroon-robed monks chatting as they walk the streets. Don't expect a tranquil mountain town blessed by Tibetan Buddhism as many travelers do or you'll wind up disappointed! Although the air is much cleaner than that in Delhi, horn-blasting traffic continuously clogs the narrow, rubbish-strewn streets. You'll also encounter plenty of stray dogs, wandering cows, beggars, and a handful of scammers who prey on tourists. Restaurants serve steaming momos; temples offer workshops and classes; Tibetan culture is apparent everywhere in McLeod Ganj. The opportunity to learn about Tibetan Buddhism and the plight of Tibet is everywhere. Numerous cafes offer opportunities for warming drinks and enlightening conversation. Begin your visit by grabbing a free copy of Contact magazine — available in the Tibet Museum — or check their website for events and happenings. You'll find talks, workshops, and documentaries about Tibet. McLeod Ganj is a popular destination for people who want to study Buddhism, holistic therapies such as massage, and participate in meditation retreats. The best way to interact with the local Tibetan community is by taking advantage of the numerous volunteer opportunities, even if it's only spending an afternoon to help Tibetan refugees practice their English. The Tibet Museum at the southern end of town screens excellent documentaries and is a good place for learning about what's going on in town. Fortunately, you won't find many high-rise hotels around Mcleod Ganj. But you will find an abundance of smaller guesthouses in all price ranges. These family-run places vary from the scary and grungy to cute and comfy. All rooms include a personal hot water heater that must be switched on in advance. Most rooms are not heated, but some places offer personal heaters for an additional charge. Nicer rooms include a balcony with a view of the valley. Cheaper options may not even include bedsheets or towels! There are several midrange guesthouses along Bhagsu Road just off the main square. For cheaper and long-term stay options, consider walking down the stairs below Yongling School on Jogiwara Road to the numerous budget guesthouses. Another option is staying in the quieter village of Dharamkot, a steep, one-kilometer walk from the main square. Always ask to see a room first; many places smell moldy because of the persistent dampness of the valley. Stay away from rooms facing the main street; horns blare even in the night. With plenty of Western travelers visiting McLeod Ganj, you'll never run out of budget and midrange restaurants around town. Indian, Tibetan, and Western food (especially pizza) is the norm. Vegetarian fare is pretty well the rule rather than the exception, although a handful of rogue eateries cook chicken and mutton. Many restaurants have outside areas or rooftops with a mountain view; a majority advertise Wi-Fi which may or may not be working. McLeod Ganj is a great place to give Tibetan food a try, particularly momo (dumplings), Tingmo (steamed bread), and a bowl of warming Thukpa (noodle soup). Excellent herbal teas are available everywhere as is chai. Lung Ta: This nonprofit Japanese restaurant has a daily set menu; the vegetarian sushi days are the most popular. All proceeds support the Gu-Chu-Sum Movement of Tibet, an organization that helps political prisoners from Tibet. Seven Hills of Dokkaebi: An authentic Korean restaurant with fireplace, great food, large library, and classy music. The large pots of Korean teas are a great deal. McLlo Restaurant: Impossible to miss in the main square of town, this towering tourist restaurant isn't the cheapest but has the thickest menu in town. Uniformed staff deliver mountain trout and international fare that you can't find elsewhere. Although places that attract a lot of backpackers tend to have plenty of nightlife, don't expect much in McLeod Ganj. In fact, the town practically shuts down around 10 p.m. You'll find the two best choices on rooftops in the main square. X-Cite, despite being dark and intimidating, is a large discotheque open late. McLlo Restaurant, one of the busiest tourist restaurants in town, has a pleasant rooftop bar. While smoking is usually tolerated inside the rooftop bars, you can be fined for smoking on the street. Don't do it! Despite being in the foothills of the Himalayas, McLeod Ganj is only at an elevation of 5,741 feet (1,750 meters). The elevation isn't drastic, especially when compared to destinations such as Leh, however, nights are cooler than you would expect. They feel even cooler after sweating in other parts of India. With temperatures in the upper 80s, sunny summer days can be scorching. Things cool drastically in the evening. You'll need warm clothes and a jacket in the spring, fall, and winter months; numerous shops around town sell warm clothing and fake jackets simulating very recognizable outdoor brands. The rainiest months in McLeod Ganj are July, August, and September. Power cuts are a common occurrence; carry a flashlight with you and be careful about charging electronic devices unattended. Generator starts can damage them. If the lights begin doing funny things, unplug! Many cafes and hotels advertise free Wi-Fi, however, speeds can be painfully slow depending on time of day and the weather. Be mindful about using shared computers to handle personal business. Jackets and outdoor gear aren't the only fakes found in shops. Counterfeited Western-brand cigarettes are a thing as are water bottles refilled with unsafe water. Always check the seal before paying. The valley stays green for a reason: McLeod Ganj gets a lot of rain! An umbrella and rain gear are excellent investments; they're for sale everywhere. Although mornings are usually clear, keep in mind that weather changes very quickly in the valley. Be prepared when hiking to neighboring villages. Rubbish and plastic bottles are piled high in McLeod Ganj. Take advantage of the water-refill stations in restaurants and guesthouses. You can refill bottles at Nick's Italian Kitchen and the Green Restaurant on Bhagsu road.